Cannabidiol (CBD) is a phytocannabinoid molecule found in hemp (Cannabis sativa), just like the well-known psychotropic substance, tetrahydrocannabinol (THC). However unlike THC, CBD has no narcotic properties. THC was the first psychoactive ingredient to be discovered in marijuana (1-3), but it was only in the 1990s that scientists identified the endogenous signalling system now known as the endocannabinoid system. This is a collection of endogenous messengers (endocannabinoids) and specific receptors located on external cell membranes (CB1 and CB2 receptors). It works on a simple principle: when the body deems it necessary, endocannabinoid messengers are produced which bind to their corresponding receptors, triggering various cellular responses such as stimulation of appetite, limitation of synaptic transmission, anti-nociceptive effects (pain relief), hypothermia or reduction of spontaneous locomotion (4). We know, for example, that endocannabinoids are effective at inhibiting the transmission of small diameter nociceptive fibres (which are involved in the pain process) and at reducing the release of neurotransmitters such as substance P, which are responsible for the transmission of pain. What’s less straightforward is how this system influences several complex mechanisms such as neuroplasticity, apoptosis, neuro-inflammation and traumatic memory. It so happens that plants produce molecules that have a strong resemblance to endocannabinoids, so much so that they are able to bind to the same receptors (with varying degrees of affinity). Some of them, including THC, produce cellular responses which are very similar to – or even greater than - those triggered by endocannabinoids. Cannabis contains more than 200 types of molecule that mimic endocannabinoids, including cannabidiol (CBD) which may account for up to 40% of the plant’s dry extract. How does CBD work? What are its benefits? The CB1 and CB2 receptors to which endocannabinoids and phytocannabinoids bind are not randomly located in the body. They’re primarily found on the surface of cells of the human brain, central nervous system and immune system tissues. The hippocampus (particularly the dentate gyrus) as well as the Globus pallidus which controls movements (5) have a very high concentration of CB1 receptors, whereas immune tissue has a higher density of CB2 receptors (6). Their specific siting suggests that cannabinoids are involved in modulating memory, emotion, pain (chronic, inflammatory and neuropathic) (7-8) and movements (9-10). 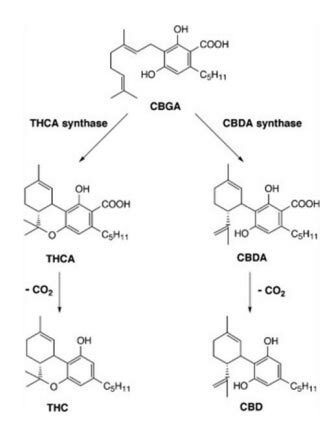 CBD binds more to CB2 receptors, and THC to CB1 receptors. When CBD binds to its receptors, it triggers a chain reaction which results in a decrease in the release of neurotransmitters. The binding of CBD to CB2 receptors appears primarily to reduce the inflammatory response. This involves multiple cellular targets and leads to a rise in BDNF (a protein that encourages the growth and differentiation of new neurons), a reduction in microglial cells and a fall in pro-inflammatory mediators (11-13). It is this anti-inflammatory effect which makes CBD so useful for pain relief. CBD thus helps lower the production of inflammatory cytokines, maintain cerebral circulation during ischaemic events and reduce neuro-inflammation (14). It also helps increase levels of adenosine in the brain which is associated with neuroprotection and decreased inflammation (15). In addition, it helps to activate PPARs (16), proteins that act as transcription factors of certain genes involved in inflammation and pain transmission. Several studies have shown it to have additional benefits: it promotes vasodilation (17-18) and helps reduce reactive oxygen species (ROS) as well as lipid peroxidation (19-21). CBD is also involved in modulating receptors outside of the endocannabinoid system. For example, serotonin receptors also appear to play a part in CBD’s benefits and therapeutic properties. CBD can reduce the intensity and impact of symptoms associated with chronic anxiety and stress (22-23). Human imaging has shown that CBD affects areas of the brain involved in the neurobiology of several psychiatric disorders. According to one study, a single dose of CBD administered orally to healthy volunteers altered resting activity in limbic and paralimbic regions of the brain (24-25). Research has also shown a potential reduction in memory associated with traumatic experience. an effect on certain stress responses. How is CBD Oil 6% produced? Following extraction, CBD is diluted in hemp seed oil. Ordinarily, hemp seed oil contains very little CBD (0.0025%). CBD is mostly found in the flowers of Cannabis sativa and, to a lesser degree, the leaves, but not in the seeds. 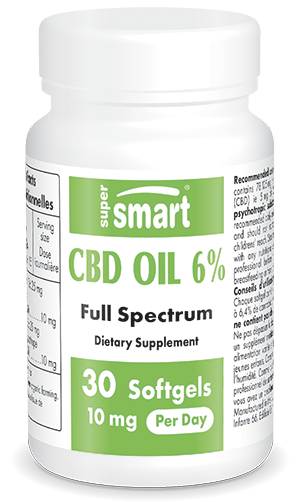 CBD Oil 6% therefore contains hemp seed oil to which CBD extracted from hemp flowers has been added. When cannabis grows, it produces THC-A and CBD-A, not THC or CBD. It is only when the two molecules are heated that they are decarboxylated into their active forms (27). The conversion of CBD-A into CBD can also be achieved more slowly by exposing the molecule to light, to heat (the temperature of gastric fluids is 37°C) or over time (28). CBD Oil 6% contains CBD and not CBD-A, as well as small amounts of a number of other phytocannabinoids. There is currently no product on the market offering greater CBD oil benefits. Are there any CBD oil side-effects? The hemp used in this product contains no THC. . It therefore has no narcotic effect and has an excellent safety profile in humans. Once ingested, CBD is quickly distributed around the body. Its lipophilic nature means it rapidly crosses the blood-brain barrier to reach tissues in the brain. It does not alter the heart rate and affects neither blood pressure nor body temperature. The half-life of CBD is 9 hours, after which it is eliminated vie urine in a metabolised form. Its softgel format and the fact that SuperSmart guarantees the purity of its ingredients means there are no particular contraindications associated with its use. To date, there have been no public health problems reported with the use of a THC-free hemp oil standardised in CBD. What other steps can be combined with taking CBD Oil 6%? CBD Oil 6% can be combined with InflaRelief Formula, an enhanced formulation for relief of inflammation problems, with Natural Pain Relief, a natural, universal painkiller, and with Posinol 50 mg, an extract of Apocynum venetum which promotes mental relaxation. No RDA established. Other ingredients: organic olive oil. Be careful: We do not deliver CBD Oil 6 % in this/those state(s) and countrie(s) : IDAHO (ID), KANSAS (KS), NEBRASKA (NE), SOUTH DAKOTA (SD).